The Brooklyn Heights Loft occupies the top two levels of a converted YMCA building. The owners requested that the space be remodeled to create a space where both of their individual, extensive collections of art and books could coexist. They also required a home that would be great for dinner parties and entertaining. The building was converted into apartments in the early 1980’s and the loft had not been renovated since then. Hung ceilings were removed throughout the space to create large, open spaces where rooms had previously felt cramped and small. The window wall at the open living / dining room was completely covered with adjustable bookshelves with window seats to contain their collection while hiding unattractive radiators and emphasizing the grand scale of the wall. The existing steel staircase was “re-dressed” to create an attractive and sculptural stair reminiscent of the huge, original building entry stair. A long line of painted wood hooks was placed at the entry beneath the stair for easy coat storage. 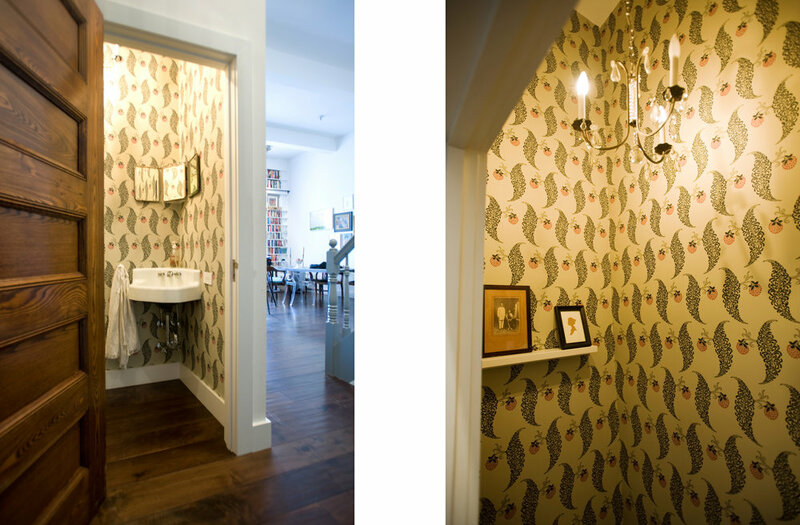 The powder room at the entry was improved with a salvaged door, vintage wallpaper and a rewired, vintage chandelier. A new open kitchen was installed to replace the dark, cramped kitchen and a small found space behind pipes was utilized as a walk-in pantry.